Solution Provider based in Singapore to bring Endeavor's best-of-breed CPQ applications to the Asia Pacific Region. We were introduced to Endeavor through our partnership with SugarCRM and we know that the Asia Pacific region is ready for a better CPQ offering. - Benny Ng of iZeno. Endeavor, a leading CPQ (Configure Price Quote) provider based in Dallas, today announced a strategic partnership with iZeno, a premier solution provider in Singapore. The companies will focus on solving quote to order problems in the Asia Pacific region by leveraging Endeavor’s CPQ cloud platform with iZeno’s process re-engineering and analysis, consulting, system integration and training services. Endeavor is a CPQ leader that has been solving quote to order problems for mid-market and enterprise class companies since 2000. The company’s focus is helping its customers sell more of their products and services by becoming easier to do business with. Both Endeavor and iZeno partner with the fastest growing CRM Company in the world, SugarCRM. EndeavorCPQ is highlighted on SugarExchange and is a sponsor of the upcoming SugarCon conference in New York. iZeno is a Gold Partner for Sugar and the company serves on Sugar’s Partner Advisory Board. The companies will enter into joint sales and marketing initiatives immediately and Endeavor will support iZeno in building out a CPQ practice to serve APAC. 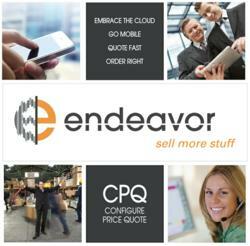 Endeavor, headquartered in Dallas, TX, is a CPQ (Configure Price Quote) provider. Founded in 2000, Endeavor publishes CPQ software to help its customers sell faster, sell smarter and sell better. EndeavorCPQ enables sales people to deliver quotes, no matter how complex, within five minutes of getting a request. EndeavorCPQ gives Sales and Marketing VP’s assurance that all quotes are 100% accurate and all proposals present the company’s brand and messaging. To learn more about Endeavor, call us at 214-736-7178 and check out the 90 second video on our home page at http://www.endeavorcpq.com. View the SugarCRM integration demo at http://www.endeavorcpq.com/integrations/sugar. Also, follow Endeavor on Twitter @endeavortweets. Established in 2003 and headquartered in Singapore with operating offices in Malaysia, iZeno is a premier solution provider of best-of-breed business applications in the Asia Pacific Region. iZeno team delivers innovative business solutions with superior customer satisfaction that accelerate business growth and produce measurable returns. Establishing long term partnership with technology leaders such as IBM, SugarCRM, Red Hat and Jaspersoft, iZeno deploys solutions across multiple industries (Telecommunication, Education, Real Estate, Government, Media, Technology and Financial Services). For more information about iZeno, visit the company’s website at http://www.izeno.com or contact them at +65 6100 2788.